Carronbank House is a Category A listed property located in the seaside town of Stonehaven in Aberdeenshire. The Georgian house was designed by renowned architect John Smith of Aberdeen and built over two levels in 1835. The property blends a range of the old and the new: wonderful new bathrooms are complimented by the cupola roof light and other fine period features including ornate cornicing and a picture rail. The dining room and drawing room are elegant and well proportioned with attractive fireplaces. The south-facing study has French doors leading out to the garden. The master suite is across the hall, next to the second bedroom, while a staircase leads to the lower ground floor. The kitchen is large and inviting, and also has French doors out to the garden. Bedrooms three, four and five lead off the rear hall and an impressive bathroom off the main hall has an adjacent sauna. There is generous storage and a wine cellar. Outside the gardens offer a high degree of privacy and The Carron Water flows along the southern boundary of the property. 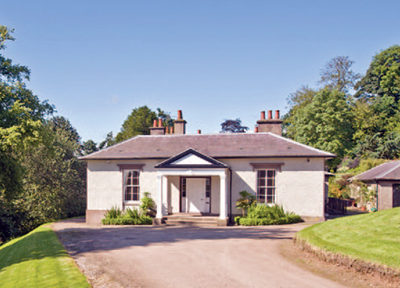 The landscaped gardens and grounds come to around two acres in total, with lawns, mature trees and shrubs including an abundance of rhododendrons. Stonehaven in Aberdeenshire has a wide range of shops and amenities, and Aberdeen itself is just fifteen miles away. The guide price is £825,000. For further information please contact Strutt & Parker on 01330 826 800 or visit www.struttandparker.com.